This connection involves a Digital TV converter box, satellite receiver, combo vcr/dvd and Analog TV. You can use a standard splitter in reverse for this hookup if you only have one of the sources (DTV box or satellite box) powered on at a time. Otherwise you could use a A/B switch. • Analog TV older model. • RF input for antenna/cable signals. Digital Satellite TV service and over-the-air antenna are used to receive TV signals. 1. Connect a coaxial RF cable from the RF output on the satellite box and the DTV box to splitter. 2. Connect a coaxial RF cable from the output of the splitter to VCR RF input. 3. Connect a coaxial RF cable from VCR RF output to RF Modulator. 4. 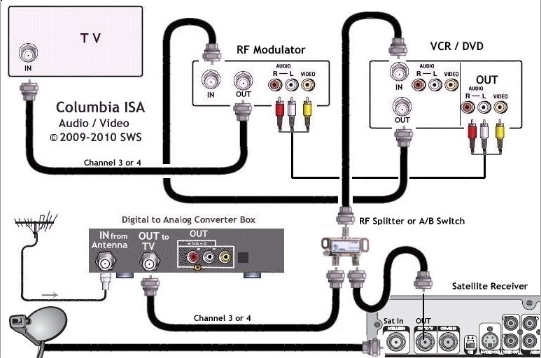 Connect a coaxial cable from RF Modulator to TV VHF input. 5. Connect RCA cables from common output on VCR/DVD to RF Modulator. o To view TV shows including satellite and over-the-air local channels. o To record TV shows from both sources. The satellite box and the DTV box should be setup to output on channel 3 (or 4). The VCR should be set to record channel 3 (or 4). The RF Modulator should be set accordingly to output on channel 3 (or 4) and the TV should be set to channel 3 (or 4). The VCR should be set to output on channel 3 (or 4).